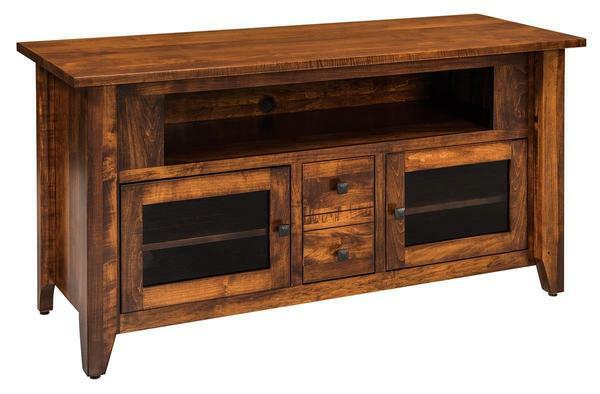 Bring your media equipment together with our Amish Unity Flat Screen TV Cabinet. Its contemporary Shaker-style design includes a 1-inch thick top, open shelf with cord hole under the solid top, two lightly smoked glass doors with one vented adjustable shelf behind each and screwless, removable backs. A center drawer that looks like two drawers slides out to reveal media and DVD storage. Massive 3" x 3" tapered legs in the front anchor the clean, functional design. Available in all wood species, except walnut, this TV cabinet can be ready to ship in two weeks if made in unfinished brown maple. Shown in brown maple with FC10901 golden brown stain and #49 hardware.